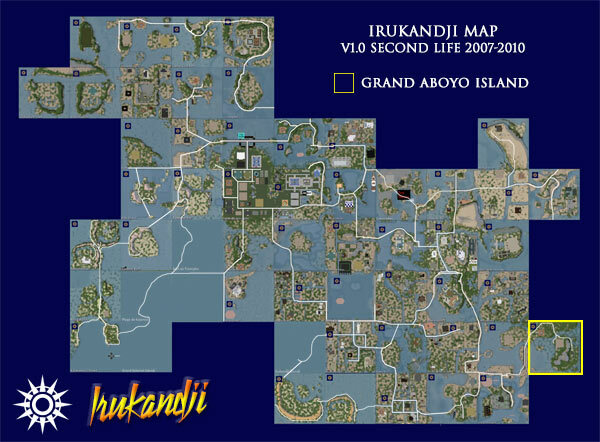 Grand Aboyo Island was one of the last islands I added to the Irukandji Continent in Second Life. Part of Aboyo State in the far east of Irukandji, Grand Aboyo Island featured a flat beach for housing, and a central mountain, Grand Aboyo, after which the island was named. At 210 metres high - twice the height of Mount Kiribati on Nouvelle Kiribas - Grand Aboyo was the tallest mountain in the kingdom. A number of boutique parcels sat nestled at the base of the mountain, and a terminus branch of the Trans Irukandji Causeway serviced the individual properties on the island. Neighbouring simulators were Old Fort Island, Toraboyo Beach, and Cabria Island.